When the weather outside is frightful, it’s the perfect time to relax under a cozy blanket with a book. Unless you’re a kid, that is. For kids, it’s the perfect time to bounce off the walls. If you’re looking for ideas for indoor activities for your kids, we have lots of suggestions for you. Here is a huge list of ways to keep your kids entertained when the weather isn’t cooperating. 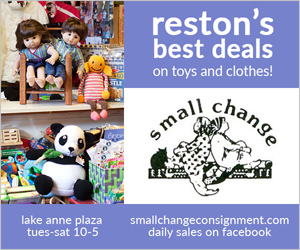 We’ve included lots of places in Reston and other parts of Northern Virginia and the Washington, D.C. area. Go explore and let us know what you think! Edited to add: When the weather is good, be sure to check out our Ultimate Guide to Outdoor Things to Do in the Reston Area. 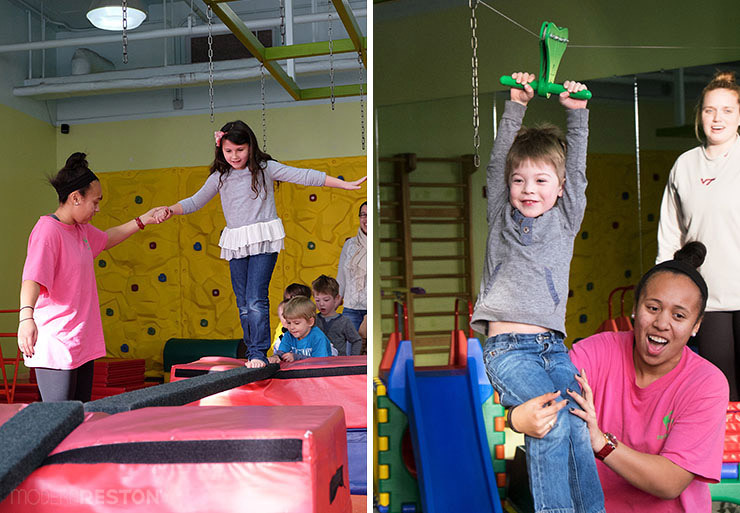 My Gym Chantilly offers fitness classes for kids ages 7 months – 10 years, as well as drop-in play times on weekdays. Monkey Joe’s in Sterling has several bounce houses, inflatable slides, and obstacle courses for kids 12 and younger. Play ‘n’ Learn in Chantilly is a store that sells playgrounds. They allow up to 90 minutes of playtime on their equipment on Thursdays. FREE, but reservations are required. Kid Junction in Chantilly offers climbing structures, tube slides, toys, and an arcade, with a separate play areas for toddlers and big kids. Kidz Plaza in Ashburn is a large play space for kids up to age 8, with a huge climbing structure, trampoline, bounce houses, and toys. Chibis indoor playground in Ashburn has open play hours every day of the week, and separate playgrounds for infants and big kids. Sport Bounce in Ashburn is filled with giant inflatables for ages 18mo+. There are open bounce hours on Mon-Fri, with special hours just for little kids. Leesburg Animal Park in Leesburg is a petting zoo that also offers a large indoor playground and toddler toy area. Reston Community Center in Reston at Hunters Woods has an indoor pool with open hours and swim lessons, including adaptive aquatics classes for people with special needs. 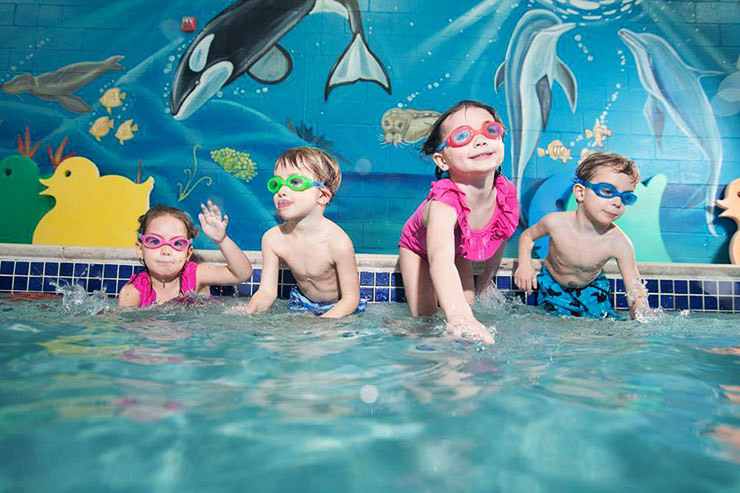 Goldfish Swim School in Reston is a brand new facility that offers children’s swim lessons in a indoor pool heated to 90 degrees. Family swim hours are available. Life Time Athletic in Reston is a sports club with family swim hours in its large indoor pool. Open to club members only. Cub Run RECenter in Chantilly has an indoor zero-entry children’s pool with an in-water playground. It also has a lap pool, swim lessons, and a large tunnel water slide. Claude Moore Recreation Center in Sterling has a giant water slide, children’s play area, and lazy river at its indoor leisure pool. 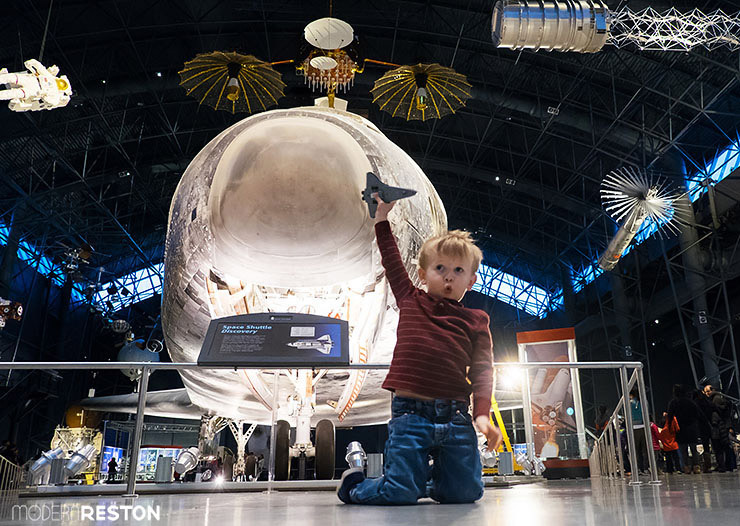 National Air and Space Museum Udvar-Hazy Museum in Chantilly is an enormous space that is perfect for taking a long, indoor walk surrounded by fascinating things to look at. Great for all ages. FREE admission, and parking is also free if you arrive after 4pm. National Building Museum in DC is a personal favorite, especially because of their hands-on Building Zone for ages 2-6. There is also a large, beautiful Great Hall where kids can play while you drink coffee from the cafe. FREE admission to the Great Hall, but exhibits have an admission fee. SkateQuest in Reston is an ice skating rink with hockey and figure skating lessons and public skate hours. During the winter, they have Snow and Story Hour for preschool children. Family Skate Night in the Vienna Community Center takes place each Friday evening until April. Bring your own quad or in-line skates. $1 per person. SportRock in Sterling is a rock climbing gym that offers lessons and day passes. Climbzone in Laurel, MD is an indoor rock climbing center with themed walls. 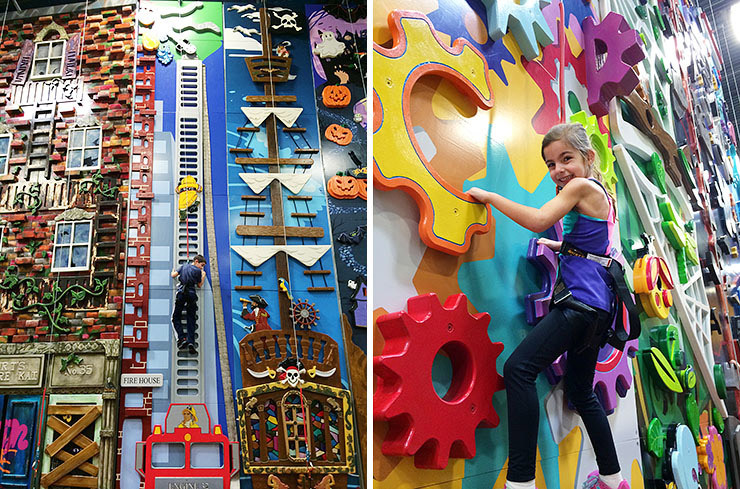 Kids can climb up Jack’s beanstalk, up the faces of Mount Rushmore, or to the top of the Empire State Building. Rebounderz in Sterling is a trampoline arena that offers dodgeball, basketball, and open jump hours. Sudden Combat in Sterling has indoor paintball, reball, and laser tag. They have open walk-in hours, but reservations are recommended. Panther Laser Tag in Sterling has laser tag games, arcade games, video golf, and air hockey. All Sports Grand Prix in Dulles is indoor go kart racing. They have a special training program for children. Bowl America has locations in Sterling, Chantilly and Fairfax. AMF Bowling has locations in Centreville, Annandale, and Alexandria. Greater Reston Arts Center (GRACE) in Reston has buckets of art supplies to help children explore their exhibits, and Free Fridays activities for kids. Admission is FREE, but some children’s activities have a fee. ArtSpace in Herndon offers art classes for children, including Art Adventures workshops for kids 4-12. Admission is FREE, but classes have a fee. Torpedo Factory in Alexandria is a fun place to walk around and observe artists in action, and they have an Art League school with classes. We covered the Torpedo Factory in a previous article here. Admission is FREE. Workhouse Arts Center in Lorton is an old prison that has been transformed into a series of art studios, workshops, and a museum. Admission is FREE, but classes have a fee. Walker Nature Center in Reston has an indoor space with live animals, hands-on activities, children’s books, and classes. Admission is FREE, but classes have a fee. Hidden Oaks Nature Center in Annandale has live animal displays, a climbing “tree” loft, an urban woodlands interactive exhibit, and classes. Admission is FREE, but classes have a fee. Great Falls National Park in Great Falls has a museum and children’s room with games, puzzles, and a Please-Touch table. Reston Community Center in Reston offers FREE Tot Time drop-in play group with toys and music for infants and kids up to age 5. They also offer dozens of classes for kids of all ages, including dance, fitness, art, music, and swimming. Introduce young chefs to cooking classes like Chocolate Candy Making for Kids, Kids in the Kitchen, and Cake Decoration. Cornerstones in Reston provides several Community Resource Centers that offer a mix of educational, social, and recreational activities. Sterling Community Center in Sterling offers drop-in Bike and Bounce every Thursday through January and February for kids up to age 5, with moonbounces, bikes, and ride-on toys. $5 per child. Other nearby community centers include the Herndon Community Center, Cub Run RECenter in Chantilly, Oak Marr RECenter in Oakton, Spring Hill RECenter in McLean, and Providence RECenter in Falls Church. 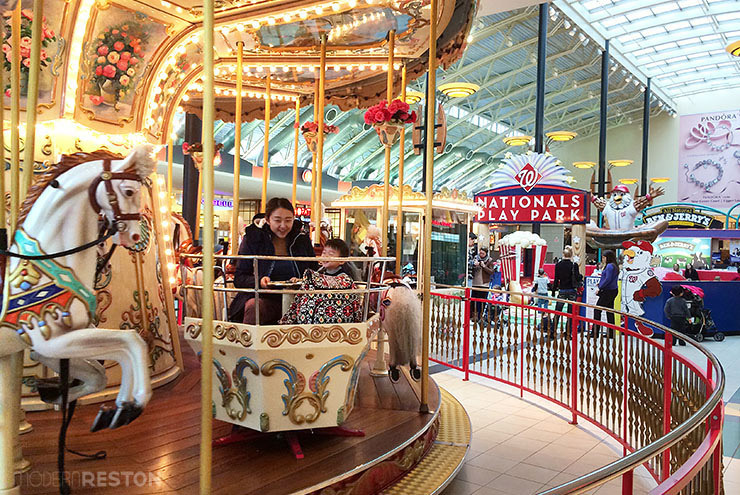 Dulles Town Center in Sterling has a carousel, kiddie train, and a new toddler playground called the Nationals Play Park. Playground is FREE. Tysons Corner Center in McLean has a National Geographic kids play area for toddlers and a kiddie train. Playground is FREE. Fair Oaks Mall has a play area with a construction theme. FREE. 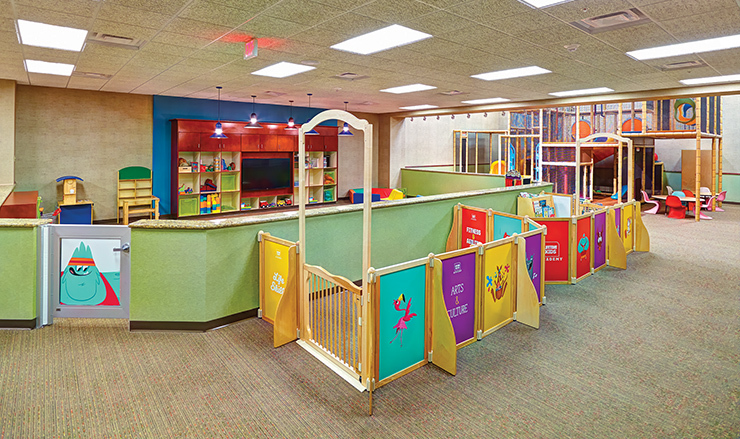 Life Time Athletic in Reston has a large childcare area called the Kids Academy, with toys, computers, a separate infant area, and a climbing structure. They also offer a vast array of children’s classes, including gymnastics, ballet, soccer, rock climbing, art, and foreign language, most of which is included with club membership. Reston Sport and Health Club in Reston has a childcare facility with a multi-story climbing playground, a basketball court, crafts, and a separate room for toddler and infants. YMCA Fairfax County Reston in Reston offers kids’ basketball, swimming, and after-school care. 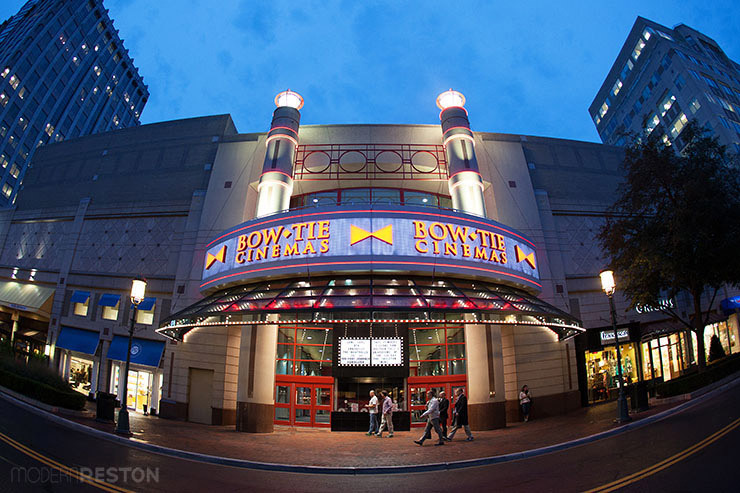 Bow Tie Cinemas at Reston Town Center plays all the latest movies, and offers occasional discounted events. Airbus IMAX Theater in Chantilly is located inside the Udvar-Hazy Air and Space Museum, and shows educational documentaries and occasional Hollywood films. Jammin Java in Vienna presents a Tot Rock music series, with concerts most days of the week. Kennedy Center’s Millennium Stage in DC offers FREE performances every day at 6pm. Imagination Stage in Bethesda teaches classes in theater arts and presents professional shows. Where do you like to take the kids for indoor fun? Please let us know if we missed any great ideas. And we’d love to know if you try any of our suggestions. Tell us what you think!